Neon Run Cape Town: Ready Get Glow! Officially the biggest festival in South Africa, with thousands attending 5 shows across the country, AV Direct had its chance to shine by providing full technical support for the Cape Town leg of the festival. The Neon Run is South Africa’s most Electric Night Event, where individuals Run, Cycle, Skate, Walk, Hop or Jump through a colourful 5Km at night covered in neon accessories and body paint. As they race along the neon brick road, fun runners will go through lumo-lit LED Lighting and ‘Glow Zones’ where they are lit up and marvel at the luminescent yellows, pinks and greens. At the finish line there’s a massive music festival, jam packed with top South African acts, and with an entertaining line up that’s bursting at the seams! 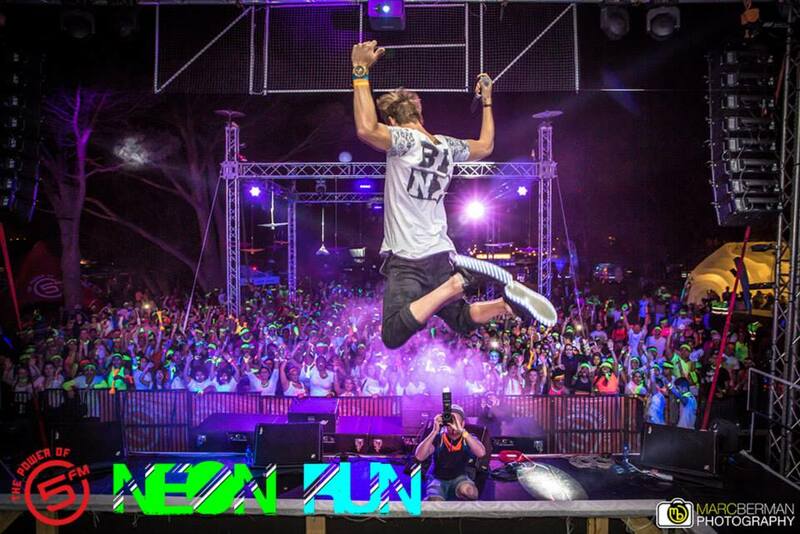 Read more about this amazing festival and visit Neon Run SA Facebook Page. We supplied our large outdoor roof structure and stage, with another truss grid system in the middle of the dance floor. These structures were rigged with over 20 UV fixtures and another 24 LED moving head lighting fixtures. Our DB Technologies Line Array system was flown for the main PA system which catered for the 4500 attendees! JBL speakers and Turbosound Milan powered speakers were used as centre array and satellite systems around the grounds. A large NEON sign made with full colour LED strips was rigged to the front of the roof and all band backline and DJ equipment was supplied. Powered with 3 of our silent generators and smaller generators at the glow stations, a fully functional outdoor solution was provided to the client. We’d like to thank Neon Run SA for the amazing organization of the event. We’d also like to thank Marc Berman Photography, Martin Le Grange and Elri Van Der Merwe for the stunning photos!